It’s time to go back to the drawing board. The critical time has come for a much-needed overhaul of the education system to take place. The education reform movement has created a period of disillusionment for parents, students, and educators. Rather than praise, the education system has taken some very hard hits from all arenas in an attempt to figure out what works best for students. Ironically, we are not reforming education, instead we are moving towards a more standardized view of what learning means. Rather than reform we conform. Educators are being reduced to a label in regards to yearly evaluation practices and as a result our teaching practices are being watered down. The expectation to be excellent is defined by results on yearly student exams in only reading, writing, and mathematics. 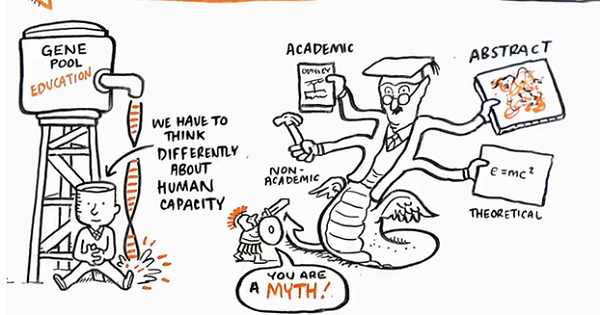 There is so much more to school than these three academic areas, albeit important ones. I find all of this so puzzling. Within the existing paradigm of education, is there a way to change the culture of the learning organization to value creativity without functioning exclusively away from learning standards? It may seem unlikely to foster creativity and innovation in a world surrounded by assessments and standardization but I like to think that anything is possible. This entry was posted in Classroom and tagged CCSS, creativity, future, reform, teachers, teaching by the5to9teacher. Bookmark the permalink.